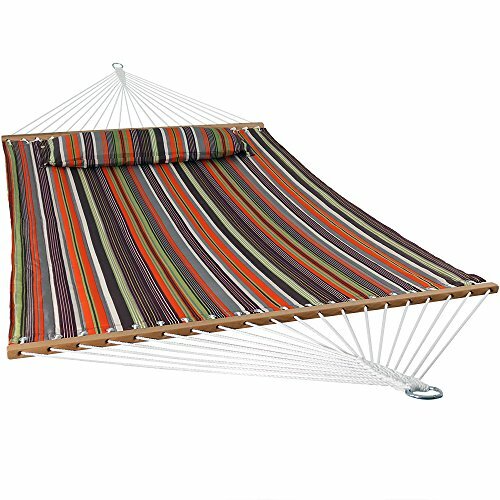 SPACE SAVING SIZE: Outdoor hammock is 130 inch long x 55 inch wide from loop to loop. Bed size is 74 inch long by 55 inch wide. Weighs 11 pounds and has a weight capacity of 350 pounds. 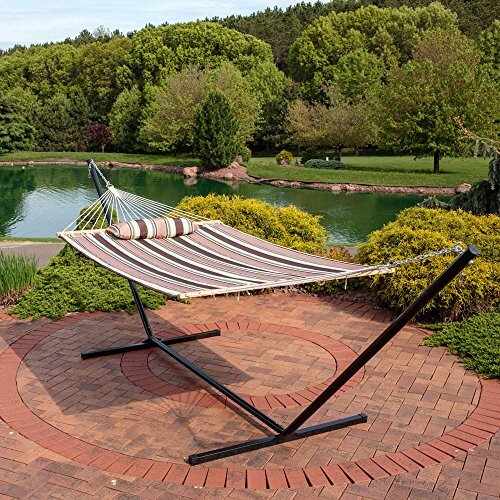 DURABLE DESIGN: Heavy duty patio hammock stand and pillow are included. The stand frame is made with 1.5 inch square/round steel tube and is 144 inch long x 36 inch wide x 48 inch deep, while weighing 25 pounds. COMFORTABLE STYLE: The camping hammock is made from dye treated polyester material, which provides UV-resistance to add longevity. The quilted hammock also features hardwood spreader bars to maximize both comfort and style. Bring comfort and style to your outdoor space! 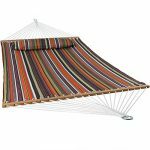 This quilted hammock or hammock and stand set features bold stripes and will surely accent your patio or backyard. It also includes the detachable pillow (that attaches with buttons), so all you need is the trees or a 12-foot, or 15-foot; hammock stand (included with some options below) if you don’t have any trees. In addition to the tasteful color combinations this quilted hammock is made from a durable polyester material that is dye treated to make it UV-resistant. They pride themselves on providing customers with a vast selection of products available in a variety of different colors and styles to ensure that you are able to find items and accessories that perfectly match the style and theme of your home’s personality. 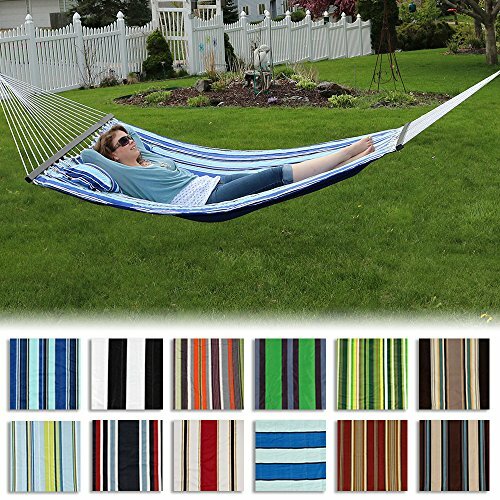 Overall hammock dimensions: 130 x 55 inches from loop to loop; with chains and S-hooks hammock extends to 152 inches long. Hammock bed size: 74 x 55 inches. Hammock pillow: 40 x 10 x 6 inches. Weight capacity: 350 pounds. Weighs 11 pounds. 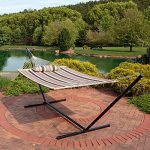 Fits 12 foot hammock stands (included with combo option or purchased seperately) or can be hung in spaces ranging from 11-13 feet. Quilted hammock polyester material is dye treated for UV-resistance and the hammock also features hardwood spreader bars to maximize style. Hammock comes with a detachable pillow and two zinc coated 9-inch hanging chains and two 2 inch s-hooks so it is easy to place.